Fr John Sullivan will be beatified on Saturday in Gardiner Street Church at 11am. This is wonderful news, but it is also big news. Beatifications and canonisations are rare events, but they are even rarer in Ireland – we have a very poor record at successful “causes”. In fact, Olympic medals are more common than beatifications and canonisations. We celebrate Olympic medals and make a big deal about them. So, too, we should celebrate when an Irish person is beatified. We should make a big deal out of it and celebrate! There is enough bad news in the Church in Ireland; we need to celebrate good news like this when it comes along! We will “celebrate” the pending beatification for the rest of this week with a number of special posts about Fr Sullivan. He was Fr Doyle’s “brother” Jesuit, and was ordained with him on 28 July 1907. Fr Doyle and Fr Sullivan (back row) pictured together in 1904, before they were ordained. Today we will have a brief synopsis of his life, on Tuesday we will look at his life of humility and penance, on Wednesday we will look at some of the cures and healing attributed to him during life, and on Thursday and Friday we will look at some of his prayers and writings. John Sullivan was born in 1861 into a position of immense privilege. His father was a lawyer, a Member of Parliament, Solicitor General, Attorney General, Master of the Rolls, Lord Chancellor and a baronet. In essence, John Sullivan was born into the very highest levels of the Irish establishment. For instance, William Gladstone, the British Prime Minister, was entertained in the family home. His mother Elizabeth was a Catholic but his father was a member of the Church of Ireland. The agreement within the family was that the boys would be brought up in the father’s religion, and the girls would follow their mothers faith. John was sent to Portora Royal School as a boarder, and from there went to Trinity College where he excelled as a scholar of classics. Having completed his degree in classics he entered the law school in Trinity but his father died while he was still an undergraduate and he left Trinity without completing his law degree, opting instead to study for the English bar in Lincoln’s Inn..
Having qualified as a barrister, he lived a rather convivial and enjoyable social life, and was once described as the best dressed man in Dublin. He was known as a particularly hospitable dining companion, and enjoyed travels on the continent. On one of these tours he stayed in the monastery at Mount Athos, and this seems to have had a strong impact on him. Around this time he started to visit the sick in hospitals, and began to study the Catholic catechism and seems to have been strongly influenced by St Augustine’s Confessions. He eventually converted, entering the Catholic Church at the Jesuit Church at Farm Street in London. He was 35 years of age. The conversion of one so deeply embedded in the establishment caused quite a stir, especially given the political culture of the day. This conversion surely caused him sacrifices that ordinary Catholics today probably cannot fully appreciate. At this time he began to dress in plainer and more ordinary clothes, spent more time visiting the sick and poor and frequently visited convents where he was often encouraged by the nuns to become a priest and join the Jesuits. This he did at the age of 40, and it must surely have been difficult for a cultured, well educated and well travelled man of the world to live and mix with novices in their late teens and early twenties. But he often disguised his great learning and accommodated himself to his younger Jesuit colleagues, serving them in any way he could. 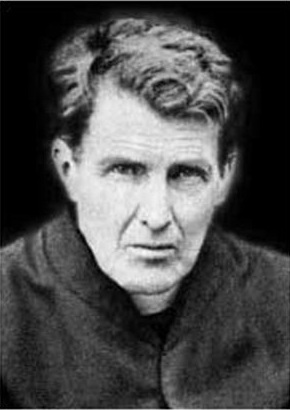 He was ordained in 1907 and spent his remaining 26 years as a teacher and spiritual guide in Clongowes Wood College (where Fr Doyle also served for two separate periods prior to his ordination) as well as a short 5 year stint as rector of Rathfarnham Castle, where Fr Doyle has also previously lived. Fr Sullivan died in Dublin in February 1933 of gangrene of the small intestine.